Our animal companions bring so much unconditional love and joy to our lives. By offering them the non-invasive healing support that Reiki can bring, we honor their well being. Help your pet's physical, emotional, and mental well-being with hands-on healing. Reiki brings the animal's body into balance on all levels - physical, mental, and emotional. By nature, animals are very accepting of the gentle warmth and vibrations experienced during a Reiki session. A Reiki practitioner is trained to access the energy and transfer it to another. Once absorbed, the life force energy automatically goes where it is most needed. 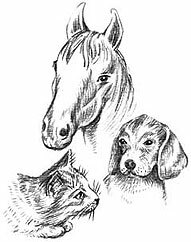 Reiki works well for dogs, cats, horses, fish, birds, etc. and accelerates their own healing abilities while adding to their quality of life. We travel to your pet which allows for a less stressful, more comfortable experience. Reiki also helps with the end of life transition as it brings peace and relief from struggle and/or pain. Many pet owners take our Reiki I & II workshops for the sole purpose of offering the healing support and comfort to their animal companions whenever they need or want it. For more information on our workshops call (603) 262-9366. Pet Reiki treatments range from $40 - $60. Reiki can benefit all living creatures.